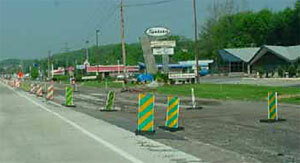 Part 6 of the Manual on Uniform Traffic Control Devices (MUTCD) describes several types of channelizing devices that can be used to warn road users and guide them through work zones; these devices include cones, tubular markers, vertical panels, drums, barricades, and temporary raised islands. On higher speed/volume roadways, drums and/or vertical panels have been popular choices in many states, due to their formidable appearance and the enhanced visibility they provide when compared to standard cones. However, due to their larger size, drums also require more effort and storage space to transport, deploy and retrieve. Recent editions of the MUTCD have introduced new devices for channelizing; specifically of interest for this study is a taller (>36 inches) but thinner cone. While this new device does not offer a comparable target value to that of drums, the new devices are significantly larger than standard cones and they offer improved stability as well. In addition, these devices are more easily deployed and stored than drums and they cost less. Further, for applications previously using both drums and tall cones, the use of tall cones only provides the ability for delivery and setup by a single vehicle. An investigation of the effectiveness of the new channelizing devices provides a reference for states to use in selecting appropriate traffic control for high speed, high volume applications, especially for short term or limited duration exposures. This study includes a synthesis of common practices by state DOTs, as well as daytime and nighttime field observations of driver reactions using video detection equipment. The results of this study are promising for the day and night performance of the new tall cones, comparing favorably to the performance of drums when used for channelizing in tapers. The evaluation showed no statistical difference in merge distance and location, shy distance, or operating speed in either daytime or nighttime conditions. The study should provide a valuable resource for state DOTs to utilize in selecting the most effective channelizing device for use on high speed/high volume roadways where timely merging by drivers is critical to safety and mobility.